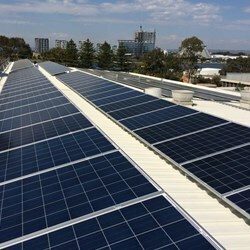 In October 2015, West Perth based Carbon Reduction Ventures, in conjunction with Planetary Power Solutions, designed upgrades to the existing solar array installed at Trinity College in 2011. This design optimised the yield from the existing 30 kW of inverter capacity, and in doing so improved the financial performance of the system while also reducing the carbon footprint of the school two fold. The total panel capacity of this system raised to 42.28 kW. In October 2016, Carbon Reduction Ventures, in conjunction with WA Alternative Energy and Petro Min, completed a second solar system, comprising 50 kW of inverter capacity and 67 kW (210 panels) of LG modules. A new website will soon be available to view Trinity's energy consumption and self-generation.